Christopher Banner as Batman, Francine Staley Morey as Catwoman, Dean LeCrone as the Joker, and Jay Seven (in front) helped celebrate the debut of two new exhibits at the California Center for the Arts, Escondido on May 20. The exhibits will run through Aug. 14. A dual exhibition preview party May 20 at the California Center for the Arts, Escondido — officially titled, “My Hero & Unlocking Wonderland Preview Party Fundraiser,” was a sensational, unique and magical night of art and artists. It was a tremendous party with a huge turnout. Gallery shows making their debut that evening included: “My Hero: Contemporary Art & Superhero Action” (art celebrating superheroes) and “Unlocking Wonderland: The Exhibit” (art celebrating the 150th anniversary of “Alice’s Adventures in Wonderland”). Through a sprawling collection of artwork, explains the center, “My Hero: Contemporary Art & Superhero Action” provides a glimpse into the secret lives of our most loved superheroes. Created in a variety of media by artists from the region and around the world, these interpretations range from dark to humorous and familiar to new. 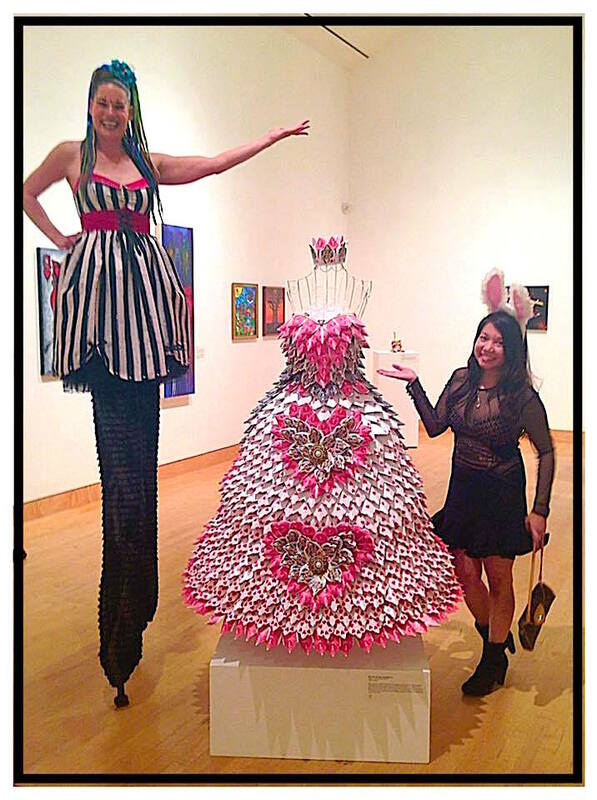 Stilt-walker Jay Seven, left, with artist Erika San Luis Holly present Holly’s “Alice in wonderland”-inspired floral creation during a gallery preview party and fundraiser at the California Center for the arts, Escondido on May 20. For “Unlocking Wonderland,” more than 25 world renowned artists who have worked for the likes of The Walt Disney Company, DreamWorks Studios, Blizzard Entertainment, Henson Studios, 3D Systems, and Gentle Giant Studios, including the SyFy Network’s celebrity “Face Off” judge, Neville Page, created works. 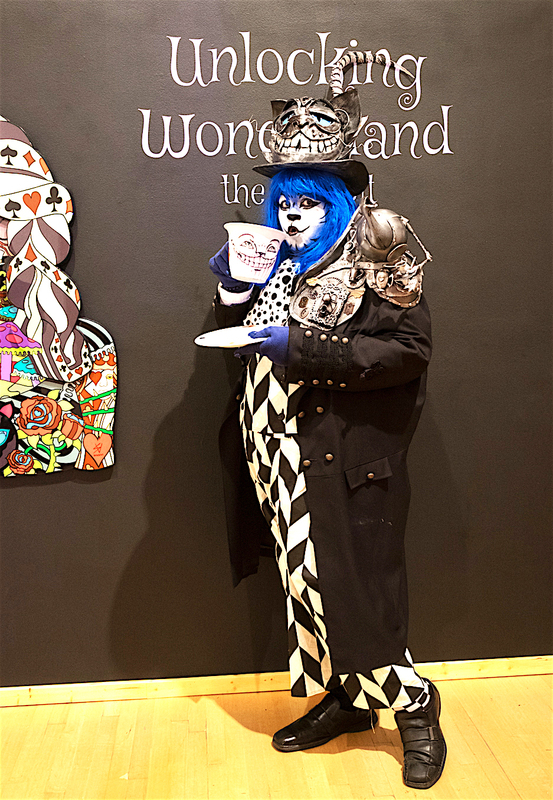 The “Unlocking Wonderland” exhibit explores the fantasy and whimsy that has kept audiences spellbound for well over a century. The exhibition also aims to raise awareness for the Global Medical Relief Fund, which works to aid child ren around the world who are missing or have lost the use of limbs or eyes; have been severely burned, injured due to war, natural disaster, or illness. Several pieces of original works created by children who have received aid from the GMRF are on view. Joe Phillips played a cheshire cat with a steam-punk style. Neville Page also attended the party, which was a wonderful surprise to many. He was very open and generous with his time talking to fans. Music and food was prepared by the center’s award-winning kitchen, and drinks provided by Stone Brewing Company, Latitude 33 Brewery and Old Harbor Distilling Co. Live art was provided by artist Daniel Jaimes. Performance artist Jay Seven, who has a cirque entertainment company called J7 Productions, was a towering “Alice” on stilts at 11 feet. Costumed cosplayers specific to the gallery exhibition themes made for creative expressions. A Batman, a Queen of Hearts, a Steampunk Cheshire Cat, Harley Quinn, Poison Ivy, and others entertained guests. This roving reporter portrayed the Joker, and along with the ‘Tower of Stilted Power” Jay Seven, interacted with the “audience” of guests all evening long. 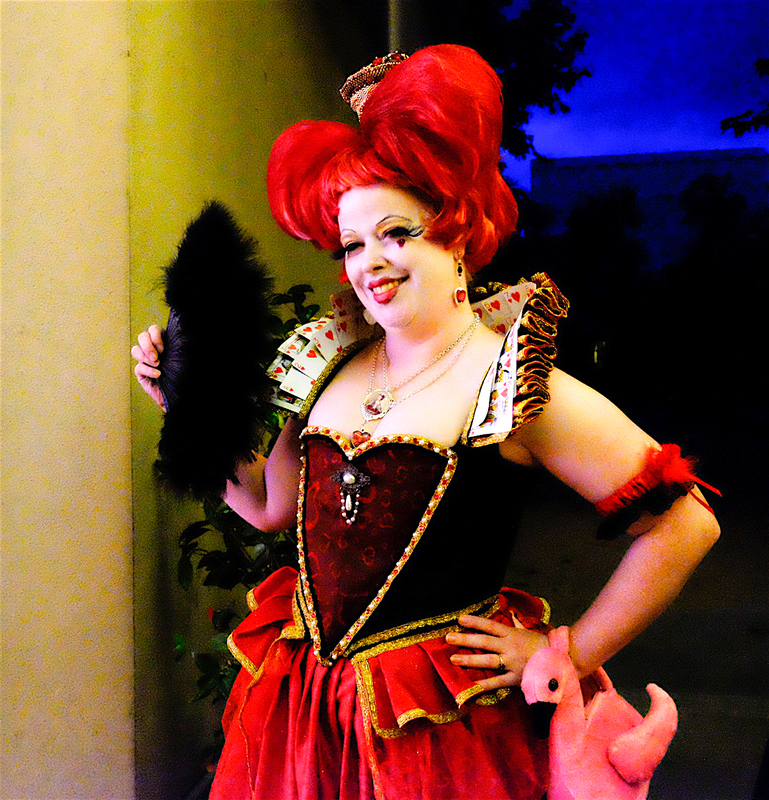 Melinda Kimberley Layden portrayed the Queen of Hearts for the “My Hero and Unlocking Wonderland” preview party. Be the first to comment on "Art in ‘Wonderland’"